One of the things I'm doing while on medical leave is cooking. I really, really like to cook and bake, but only if I have plenty of time. I hate the day-to-day quick, stressed out cooking and the constant question about what we'll have for dinner the following day and if anything needs to be prepared ahead of time. This wasn't such a problem before Shane came along, but now I find it extremely important that we have a nice meal together every evening. Where do I get my recipes? From magazines, from blogs, from websites, from cookbooks. The blogs are the hardest to track, but ever since I found Pinterest, things have become easier. Melt 50g butter in a pot, add 500g sliced carrots, 300g diced sweet potato, 1 diced onion, toss in the butter until coated. Cover and cook gently for about 10 minutes, adding a little water if necessary. Add 1.2 liters of vegetable stock, a couple of potatoes, loads of fresh coriander and simmer for about 20 minutes or until all the vegetables are soft. Whizz and serve. We (I mean Shane) finished all the soup in no time, but we had leftover muffins that Joe took in to work - they were a hit with his colleagues too! Since the muffin recipe came from Pinterest, this is my first 'task' for the Pinterest challenge that Trish is running in May. 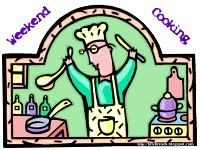 It's Monday today, but I'm also entering this post into the Weekend Cooking weekly event hosted by Beth Fish Reads. 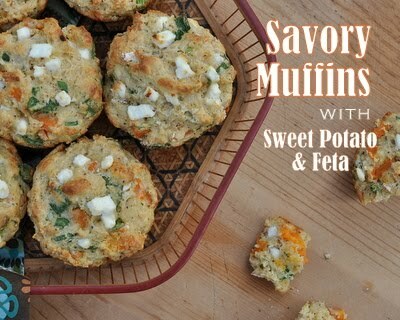 I love savory muffins. Such a nice alternative to bread with soup or salad. Yum! the thought of muffins instead of bread with the soup hadn't crossed my mind - excellent idea and truly marvelous soup recipe! YUM!! I love sweet potato and have been eating it much more often since having Elle. It's funny because we still don't eat dinner together as a family--we usually feed Elle as we're cooking our meals. I think when I start feeling more confident about her eating our spice-heavy foods without upsetting her tummy things will be different. These muffins sound absolutely delicious! I must try the soup too.